The new ImagineAir exhibit on the second floor of the Children's Discovery Museum in Uptown Normal. Museum members got a sneak preview of the new ImagineAir exhibit Monday night. The reworked second-floor exhibit features several new areas, including wind turbine build-and-test stations, a “force wall” where children can knock objects over with air, and a sink-or-float interactive wall that shows how wind power can counteract gravity. The old wind maze was retooled and now snakes across the ceiling too. A visitor plays with the new "force wall," where children can focus a gust of air to move and affect differently shaped objects. 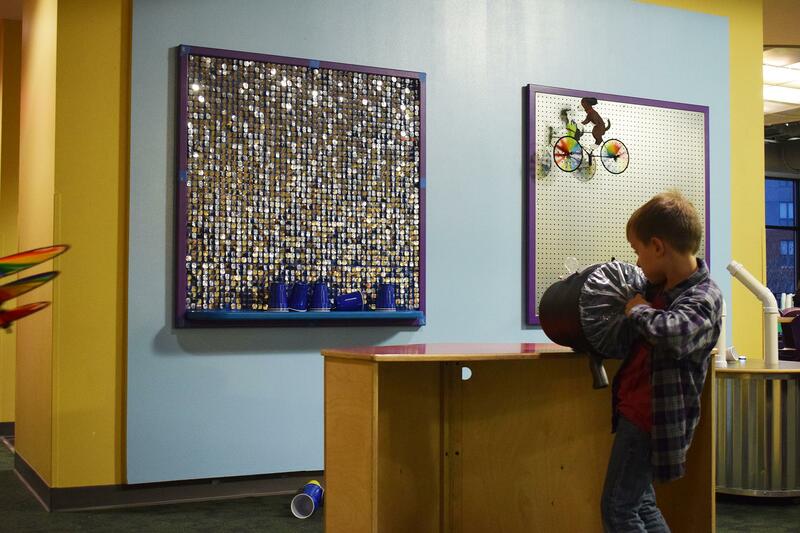 Stability with exhibits can reinforce learning, but introducing new things is important too, said Children’s Discovery Museum Executive Director Beth Whisman. The original wind exhibit was 15 years old. “It really introduces an opportunity for us to use new technology, new best practices, new opportunities, and look at how we’re reaching certain learning objectives. It’s a really vital part of staying relevant as an educational institution,” Whisman said. The focus on wind energy, aerodynamics, and fluid dynamics is a good fit for a community surrounded by wind farms, she added. “It’s something that teachers ask us to do. It’s a very hard concept for kids. But it’s something that’s very vital. And it’ll help us layer that learning as kids start to make sense of the world around them,” she said. The bulk of ImagineAir’s $127,000 price tag is being funded by a long-delayed state grant. The rest is covered by EDP Renewables, Invenergy, and private donors to the museum. ImagineAir opens to the public Friday, when a ribbon-cutting is planned.